"The official training workbook from Adobe Systems." 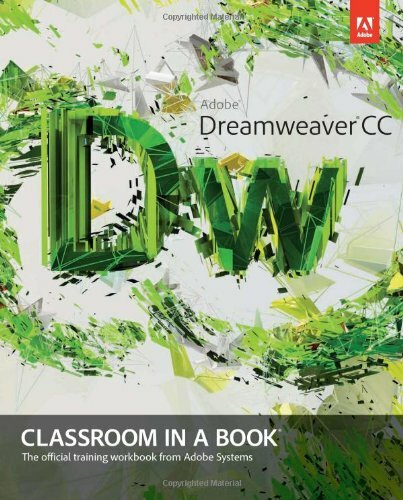 Creative professionals seeking the fastest, easiest, most comprehensive way to learn Adobe Dreamweaver CC choose Adobe Dreamweaver CC: Classroom in a Book from the Adobe Creative Team at Adobe Press. The 15 project-based lessons in this book show you step by step everything you need to know to work in Dreamweaver. You'll learn to create a professional website without having to write code by hand. This completely revised Creative Cloud edition also covers HTML5, CSS3, and media queries for responsive web design. The book also shows how to create HTML-based headings, paragraphs, lists, and tables; insert graphics and Photoshop Smart Objects; add links to text and images; apply cascading styles sheets; and customize the Dreamweaver workspace. You'll also learn to add interactive elements to your sites, such as HTML5-compatible video and animation, get guidance for working with code, and finally publish a finished site to the Web. The online companion files include all lesson files so you can work along with the book. "The Classroom in a Book series is by far the best training material on the market. Everything you need to master the software is included: clear explanations of each lesson, step-by-step instructions, and the project files for the students." -Barbara Binder, Adobe Certified Instructor, Rocky Mountain Training Classroom in a Book (R), the best-selling series of hands-on software training workbooks, helps you learn the features of Adobe software quickly and easily. Classroom in a Book offers what no other book or training program does-an official training series from Adobe Systems Incorporated, developed with the support of Adobe product experts.